Should the Mets Retire Gary Carter’s Number? 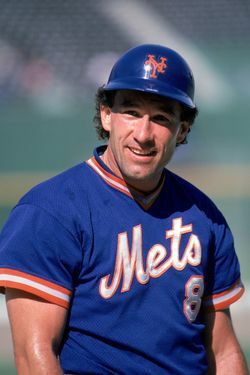 There's something a little uncomfortable about the current debate over whether the Mets should retire Gary Carter's number 8. Carter, after all, is very sick, and the emergence of the debate now means it's not simply a discussion about the quality of Carter's career, but a discussion that both factors in his production on the field and considers the question of whether this is an appropriate way to honor someone who is very sick. Weighing those things — one having to do with sports, the other having to do with something larger than sports — is an uncomfortable thing to do. This is normally the kind of debate that drives barroom arguments and sports-talk radio calls: Is Player X worthy of Distinction Y? Such debates are part of the fun of being a sports fan — but in this case, the subject is raised under some terrible circumstances. The disgrace is that the Mets had 22 years to do the right thing based on performance, based on accomplishment, based on Gary Carter's inviolable place in the collective heart of their fans. He is a Hall-of-Fame player who played the meat of his prime as a Met. He was the missing piece to a championship puzzle. Vaccaro also writes that the Mets, as an organization, always get things like this wrong. They have no idea how to connect with fans, and seemingly no concern that they don't. Fans have been clamoring for 8 and 17 to be retired for years, and yet they keep being distributed to the likes of Desi Relaford and Dae-Sung Koo. The issue never has come close to making it out of committee meetings where people with no feel for this always trump those who do. Par for the course. And it's true that many do indeed want the number retired: Mets Police notes that nobody's worn the number since 2002 anyway, and that the Mets shouldn't wait to honor Carter until it's too late. Mike Silva of NY Baseball Digest says that Carter is one of six Mets who deserve to have their number retired but have not yet received the honor. But that opinion is not unanimous. Carter played only five seasons at Shea -- way too small a span to justify number retirement, whatever his level of performance. Speaking of which, his numbers for the last three years of his Mets tenure were very weak (look at 1987, '88, and '89). Carter will always have a special place in Mets history, but you don't retire a guy's number because of one at-bat in Game 6 of the '86 Series, or for what he accomplished in Montreal, or because he has cancer. Indeed, retiring Carter's number now would be such an obvious knee-jerk response to his illness that it would trivialize his on-field accomplishments. You want to give him a Gary Carter Night, a sleeve patch, a fund-raising drive for cancer research, whatever, that's fine. But for a franchise that has always had a high bar for retired numbers, Carter doesn't make the grade. That last line is the key one. Unless you count Gil Hodges, who played in 65 games with the Mets in 1962 and 1963 but also managed them for four years (including the championship 1969 season), the Mets have retired the number of just one player from their history: Tom Seaver, the only man inducted into the Hall of Fame as a member of the franchise. There's no universal rule about these things — the Yankees' retired numbers, for example, range from all-time greats (Lou Gehrig) to very, very good baseball players (Ron Guidry) — but the Mets have set their bar high. (Carter's number, for what it's worth, had been retired by the Expos, back when they still existed.) We've always assumed that the Mets were waiting until Mike Piazza is elected to the Hall before retiring his number 31. Which brings us back to Carter. It's safe to assume that if the Mets didn't retire his number when his playing career ended — and especially if they didn't do it when he went into the Hall of Fame — that they don't consider him worthy based solely on his playing time in New York. But like we said, there's no universal rule for such things, particularly under circumstances like these. (Tyler Kepner of the Times is in favor of retiring Carter's number and wrote in to Lukas, noting that there's a precedence for this sort of thing.) We imagine the Mets will honor Carter in some way in the coming weeks. The question, then, becomes exactly how they'll do it.